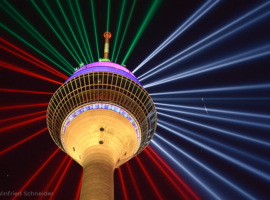 The dazzling “Rhine Comet” lit up the night sky over Düsseldorf during the 70th birthday celebrations of the federal state of North Rhine-Westphalia. 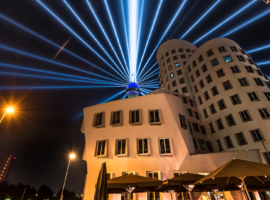 The light show, featuring FALCON BEAM 2 xenon searchlights from AO Lighting, was a gift from the community foundation “DUS-illuminated®” in collaboration with the show producer and creative mastermind Klaus Gendrung, and astonished onlookers with effects on a hitherto unimagined scale. 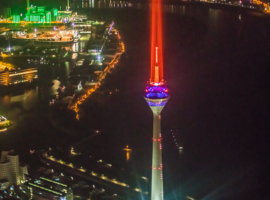 For ten days, Düsseldorf’s illuminated television tower became a landmark visible for miles around. 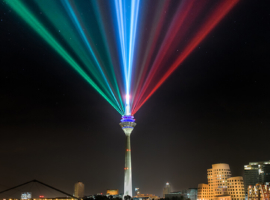 The spectacle, comprising dazzling beams of light that soared into the starry sky and fanned out before converging once again to form a pillar of light, was even visible from the neighbouring cities of Cologne and Essen and featured constantly changing colours, with particular prominence given to the green, white and red of North Rhine-Westphalia. 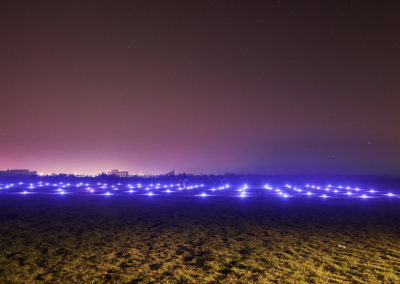 The fifteen-minute sequences were interspersed with presentations by the project’s sponsors to make up each evening’s show. 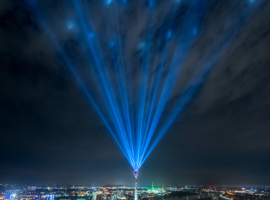 Edmund Spohr, the chairman of “DUS-illuminated”, told the Rheinische Post that the Rhine Comet was conceived as a symbol of both the state’s power of innovation and its spirit – and in times of terror and war also as a sign of peace. 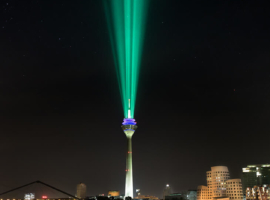 What the Rhine Comet certainly did was raise the bar in terms of visual impact, and when a storm front approached, the sight of this one pillar of light towering defiantly above the city like a rock in the breakers was an unforgettable experience. 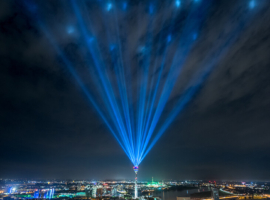 AO Lighting was commissioned by mo2 design GmbH to install the FALCON BEAM 2 searchlights on the highest platform of the television tower at a height of 194 metres. The ingenious system devised to haul the devices aloft one by one involved industrial climbers, a freight elevator and a crane as well as a considerable deployment of manpower. 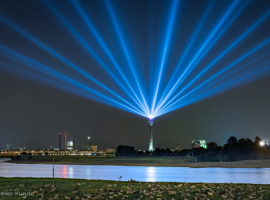 Beams bright enough to be visible for miles around naturally consume energy but, despite the extreme luminous intensity involved, a mere 444,000 watts were required in this case; energy efficiency of a high order! The installation also involved laying some 3,000 metres of cable to provide the devices with power and implement the networking. According to press reports, the electricity was sourced from green energy generated by a photovoltaic power plant. The team from AO Lighting took several days to haul the devices into place and complete the installation. 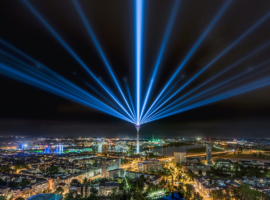 With their tightly focussed emission characteristic, the FALCON BEAM 2 xenon searchlights are the ideal instruments for long-distance lighting effects. 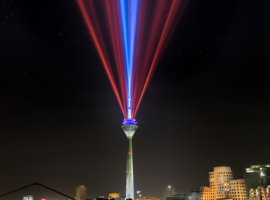 Under ideal conditions, the dazzling beams are visible from distances of up to 300 kilometres. The programming of the moving lights was implemented using a GrandMA2 light console, which made it possible for the various sets of lighting choreography to be stored and played back as and when required. Although the Rhine Comet was hardly advertised at all in advance of the festivities, it proved to be a tremendous success. 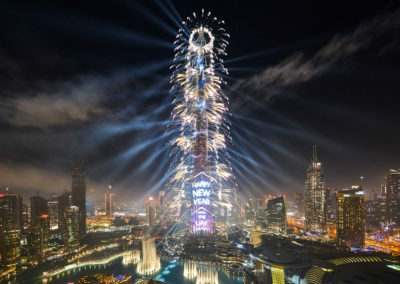 Already during the rehearsals, the spectacular interplay of the beams aroused the interest of the population and was the occasion of a great deal of comment in the social media. Naturally there was some carping too, but the predominant tone was one of enthusiasm. There was also talk of UFO sightings. Photo competitions were organized. Posts on a wide variety of channels – from YouTube, Twitter and Facebook to the press portals – were devoted to the dazzling Rhine Comet. 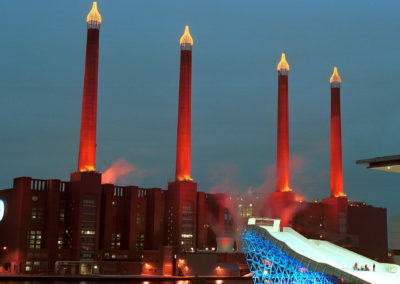 The question now, according to Gendrung, is whether the installation will make the Guinness Book of Records. 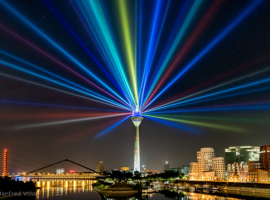 What the Rhine Comet certainly did prove was the extraordinarily powerful impact light can have.